I saw this all over Pinterest awhile back and decided to make this for my amazing husband last year for our anniversary. 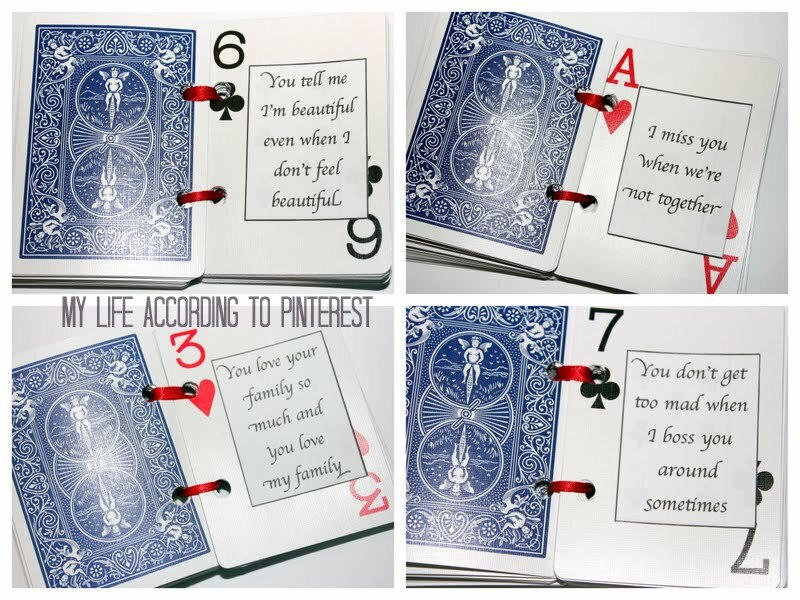 I wanted to share it with you today since it would also make a great Valentine's gift for your hubby or boyfriend. All you need is a deck of cards, your computer and printer, ribbon, hole puncher, and heart stickers. The first thing I did was punch holes in all of the cards. Sometimes that gets tough because those cards are thick. You want to make sure all the holes in the cards line up evenly so they will stack well when you put the ribbon through. Next, I made a list of all of the 52 reasons I love my husband. The reasons are infinite really, but I narrowed it down to 52 ;) After that I typed up all the reasons on my computer using PowerPoint to get each rectangle the same size. Cut them out and glued one on each card. I added some cute glittery hearts to dress it up a bit too. Please share any crafty gift ideas you've made for your hubs or bf for some more inspiration! OMG! I love this! I totally want to do this for hubby! Too cute!